Not many people remember what it was like in the early 60’s. People still remembered what it was like to take a horse and buggy to go grocery shopping. Most cars didn’t stop or go all that well and the great war was no further away than 9/11 is from us now. No computers, not everyone had a TV, kids had their bikes, matchbox cars or Barbies, and dirt to play with. When it got hot you sweat and when it got cold you shivered. Every time. Now Imagine the President of the United States telling his people and the world that we were going to the moon and we’d be going soon. I bet some of the people who heard President Kennedy tell the nation what his plans were thought he was a plastic ring short of a six pack. We hadn’t even gone to space and now we’re going to the moon? I bet people were falling off their bar stools in laughter. Not in my lifetime buddy. And yet a few short years later and a rocket shot an Apollo module and a dune buggy off into space and a couple of very lucky guys got to traverse the moons sand dunes at a whopping 5 mph or so. When you think about it that story is practically unbelievable (and some people don’t believe it) and yet to the best of our knowledge America did just that. 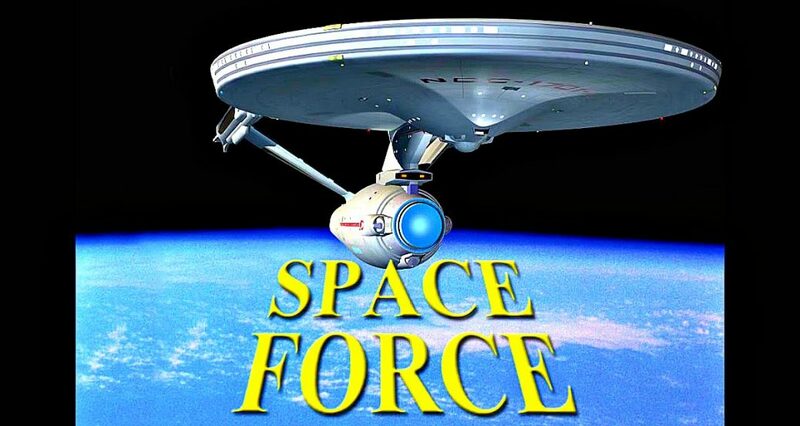 President Donald Trump is putting together a new branch of the military he is calling Space Force. My first reaction was “holy sh^&t am I living to see this too?” Screw the flying car failure this is even better. My goodness what an amazing time to be alive. I’m not real sure if we’re ready to start patrolling the planet in Colonial Vipers but even if we aren’t there yet I’m pretty sure we’re not very far away from there. A lot of things have to be done before the first Star Fighter begins defending the planet and the American way. Do we even have a logo yet? We also need both work and dress uniforms. Knowing the government just these things could take years. Not to mention that you have to create and man an entire chain of command. There’s a lot to accomplish before the first space fighter is launched. During the Obama regime NASA was ….. well pretty much nothing. We accomplished more during the 1960’s than we have for most of the 21st century and that is a real shame on us. Trumps initiative will bring engineers and scientists back to the table of space exploration and discovery where it belongs and we are all likely to see some major innovations in military and civilian technology because of it. Finally, of course is the security of the free world. There was a time when if you ruled the seas none could harm you. Then it became if you ruled the skies all would tremble before you. The next part will be space whether we like it or not. Whoever ends up dominating our immediate space will dictate the rules and I’d rather it be us than Russia, or China, or Islam. If we don’t progress in this direction one of them will. Imagine the Chinese being able to destroy satellites. We already have a lot of stuff floating around the planet that needs protecting. And who knows maybe if the rest of the world sees America flying fighters and bombers in space they’ll calm down and quit trying to destroy us. It could happen. America has assets in space that need protecting. We are either going to protect them or someone, someday is going to destroy them. Our humanitarian mission is to continue to advance in the area of space travel if for nothing more than the survival of our species which will inevitably become extinct if we never get some of us off this flying rock. We’ve got one heck of a President to stand up to the short sighted scorn of the press and the left by publicly declaring these intentions. You can also bet he sent shivers down the spines of every single one of America’s enemies when he did. God bless the Space Force of The United States of America!